"Now that you're in Tinseltown, what are you gonna do?" Everyone has their own idea of the glamor in Hollywood, but David Cronenberg's version of the home of movies in Maps to the Stars is anything but wonderful. Julianne Moore, Mia Wasikowska, John Cusack and Robert Pattinson star in this ensemble of four people who seem to just be wandering through life in Hollywood. This trailer paints a pretty intense picture, almost like a thriller, which is exactly what we would expect from Cronenberg. The performances seem to be the driving force behind the odd drama, but here's hoping the story is just as good. Check out the previous Canadian trailer right here and a UK trailer right here. 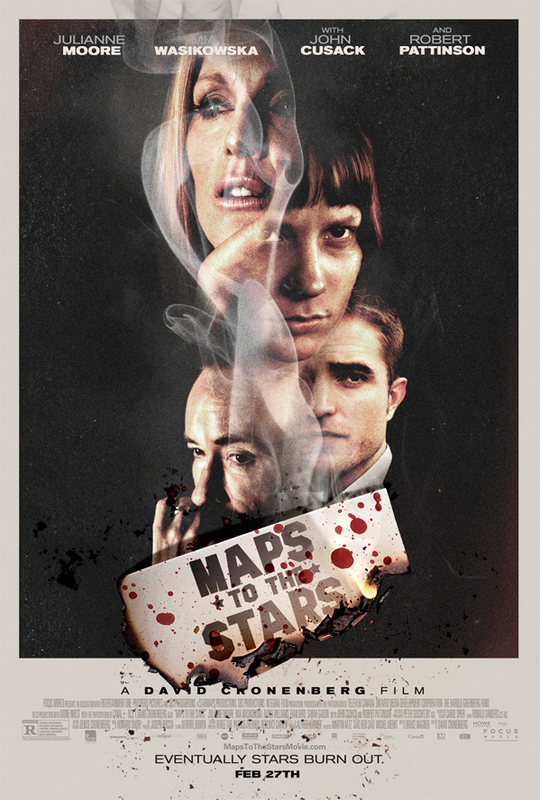 Maps to the Stars is directed by David Cronenberg (Scanners, Videodrome, The Fly, Eastern Promises, Cosmopolis), from a script by author and screenwriter Bruce Wagner (A Nightmare on Elm Street 3). The Weiss family is the archetypical Hollywood dynasty who finds themselves on the verge of implosion, each struggling with their own demons. Julianne Moore, Mia Wasikowska, John Cusack, Robert Pattinson, Olivia Williams and Sarah Gadon star in the film which premiered at Cannes and has already opened up overseas. Focus Features brings the film to VOD, iTunes and limited theaters on February 27th, 2015. Good? You have to be in a very specific mood to enjoy films like this. To each its own, but this was one of the worst movies I've seen last year. The writing (dialogue+plot) felt too amateurish and childish for me. AWESOME. It is still a bit stupefying they allow this bullocks to go down in Hollywoodland.